Took the GS for a squirt down to Anglesea to try and dial in the wind shield and also see how she went on some dirt. The reasonable Tracks of the Anglhook Nat park were just the thing. I scared my self a few times when the stones got tennis ball size but stayed upright and pottered around at about 40 Km/ h. The bike handles remarkably well and I'm sure the electronics are doing their bit. I went a lot more confidently than I expected. The wind shield needs to be taller or it needs a little spoiler to reduced wind noise and buffeting to the level experienced when I crouch down about 10cm. Hi Marcus, you should be getting used to the Beemer by now - what do you think. 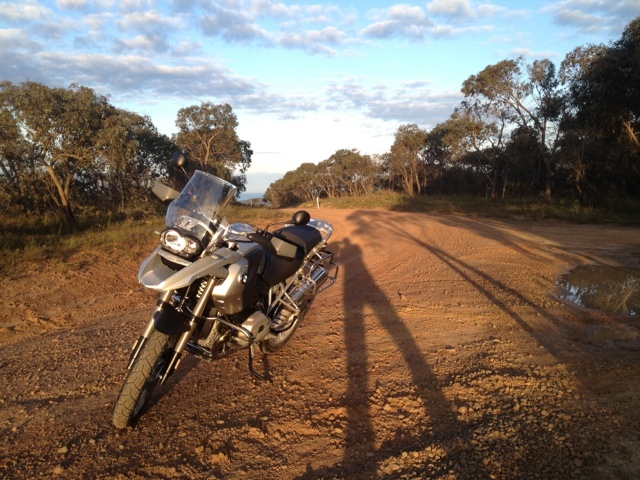 Have you finalised an itinerary for the big ride yet. If by any chance your trek north intersects with our meander south we could catch up. I'm getting Beemer withdrawal symptoms but the compensation is long warm days of relaxation here on the coast at Noosa.